SpecAir realizes there are situations where a refillable cylinder may not be possible; therefore we offer a line of disposable calibration type cylinders called One-Timers. One-Timers are available in various sizes. 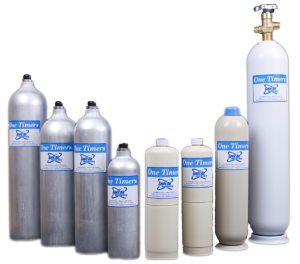 We offer a 17 liter and 34 liter CGA-600 steel cylinder along with a 105 liter C-10 version. The aluminum 34 liter and 58 liter cylinders are offered for reactive blends with a C-10 valve connection. One-Timers are perfect for all your calibration applications. These designs cover a broad range of applications from industrial hygiene to petrol chemical. One-Timers offer outstanding quality, performance and value. They maintain the high quality of standards you have come to expect from SpecAir Specialty Gases. One-Timers eliminate cylinder rental and demurrage charges, plus the added portability of these cylinders makes them perfect for specific small jobs. With the proven stability of our products, improper positive monitor readings are eliminated. Accuracy and dependability are what One-Timers deliver. Disposable Cylinder Regulators are also available for our One-Timer cylinders.